Muhammad Kirumira, Ugandan police commander has been shot dead near his residence on Saturday evening in Bulenga, Wakiso district. The maverick former police officer was with a woman, reportedly bound for home, when gunmen waylaid him and opened fire. His female occupant of the car, who was initially reported to be his wife, was also targetted. The assassins, two in number, were riding on a motorcycle without lights. The shooting happened at around 9:00pm local time. 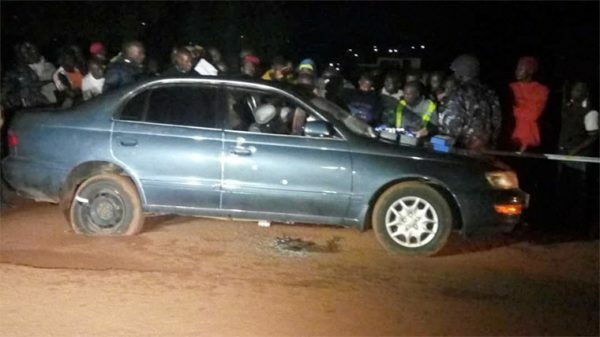 The gunmen reportedly shot more than 10 bullets at Muhammad Kirumira’s personal car that he was driving – a black Toyota Corona before fleeing from the scene. The driver’s front door glass was shattered, the right hind tyre bore gunshots and was deflated. The driver’s door bore at least 5 visible bullet scars. 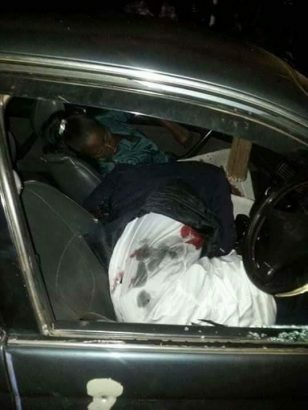 Bleeding heavily from gunshot wounds, Muhammad Kirumira and his female companion were rushed by good samaritans who removed them from the vehicle, to a Hospital in Kampala where they were later declared dead. An eye witness said he heard Kirumira pleading for mercy saying, “Bambi temunzitta” (please don’t kill). Although it’s 5-minute walk from a nearby police station, Police came to the scene of crime after more than 30 minutes according to eye-witnesses. “We have since established that the lady assassinated along with our officer, ASP Muhammad Kirumira, is not his wife. The wife was not with him at the time. “We’ve identified the lady and interacted with her family. We shall withhold releasing her name in the meantime,” a follow-up tweet on the official Police page said. Earlier in the day, Kirumira had sent out an audio message congratulating journalists for successfully electing new office bearers in Uganda Journalists Association. He had appealed to the winners to embrace the losers of the day’s polls and incorporate their manifestos for the betterment of their profession. “I am Muhammad Mwoyo Gwa Gwanga. Mwoyo Gwa Gwanga simply means patriot. I am around. I am still around. Until God says don’t be around. I am still around and my virtues and values haven’t changed,” he said. Kirumira was also a strong critic of former police boss Gen Kale Kayihura’s leadership and even faced the police court for the strong criticism and was planning to contest for a parliamentary seat later in 2021. Kirumira is the second police officer after former police spokesperson Andrew Felix Kaweesi to be shot, killed (on March 17, 2017) in almost identical style.